Author Donnacha DeLongPosted on 5 January 2011 14 May 2016 Categories anarchism, demonstrations, politics, syndicalismTags anarchism, anarcho-syndicalism, globalise resistance, reclaim the streets, stop the war, student protests, students, SWP1 Comment on Student demos: This is just the beginning – what comes next? Just before Christmas, bombs went off in two embassies in Rome, injuring staff in both. I immediately tweeted “#Anarchism has nothing to do with injuring innocent mailroom staff #Rome” and I absolutely stand by that point. Right now, across Europe and perhaps across the world, thousands of people are being introduced to anarchist ideas. Governments and politicians of all kinds have failed their people and are stealing from their populations to keep bankers and financial traders happy. Police have shown their true role as defenders of privilege with increasing levels of violence against protesters. 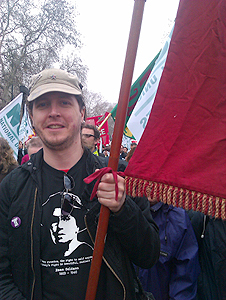 Author Donnacha DeLongPosted on 21 April 2009 14 May 2016 Categories demonstrationsTags anarchism, anarchists, demonstrations, g20, G20 meltdown, police, Threadneedle Street3 Comments on Did the cops try to cause a riot at G20?